Well...here you are at half a year old already! Oh my how time is flying by... I remember when I first found out I was pregnant with you how it felt like your birth was so far away I couldn't even imagine it really happening. When you were born I remember thinking about the 6 month mark and feeling the same way. And here it is. I feel like I will blink my eyes and you will be walking, talking, and going to preschool! I look down at you tonight, my little 6 month old boy, and still find myself amazed by you. How perfect you are - your tiny little nose, your sleepy eyes, your adorable little mouth with a dribble of milk running down your cheek as you fall asleep on my lap. To me, you are perfect. Although I miss your tiny newborn days, I am having so much fun watching you grow and learn every day. 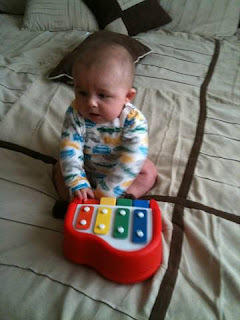 In your first 6 months of life, you have learned how to do so much! You have learned to smile and laugh. You have learned how to roll over and sit up by yourself. You have learned how to grasp things and how to put anything and everything into your mouth. You have definitely learned how to get your Mommy and Daddy's attention! You are learning how to hold your own bottle and use a sippy cup. You are growing so fast Mommy can hardly keep up! You're already wearing 12 month clothes and weigh about 21 lbs. 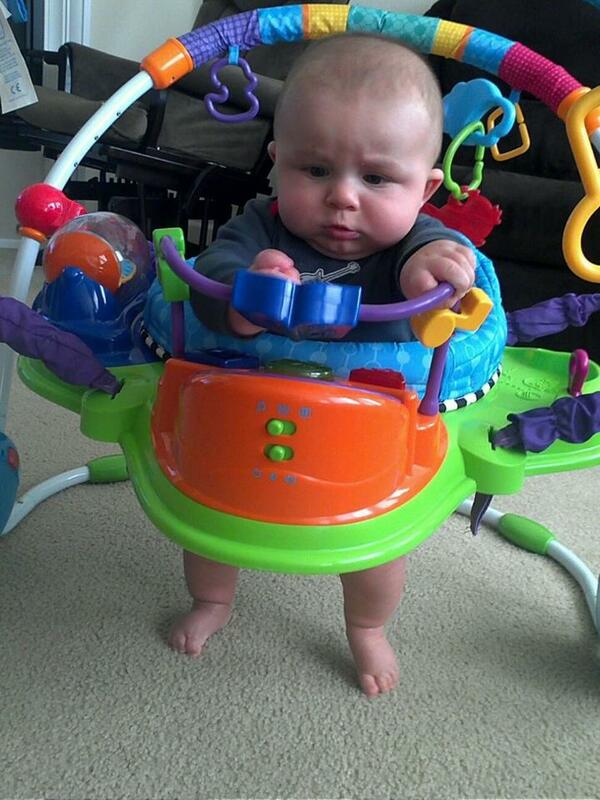 This month we had to retire your infant car seat and put you in your big boy carseat. You don't seem to like the big boy car seat as much - but I'm sure you will get used to it. You are the happiest little baby and are such a joy to me and your dad. Not much makes you cry. You love Daddy's guitar, playing your own little musical instruments, when Mommy and Daddy sing to you, and just about anything else musical. You love bath time and your jumperoo. 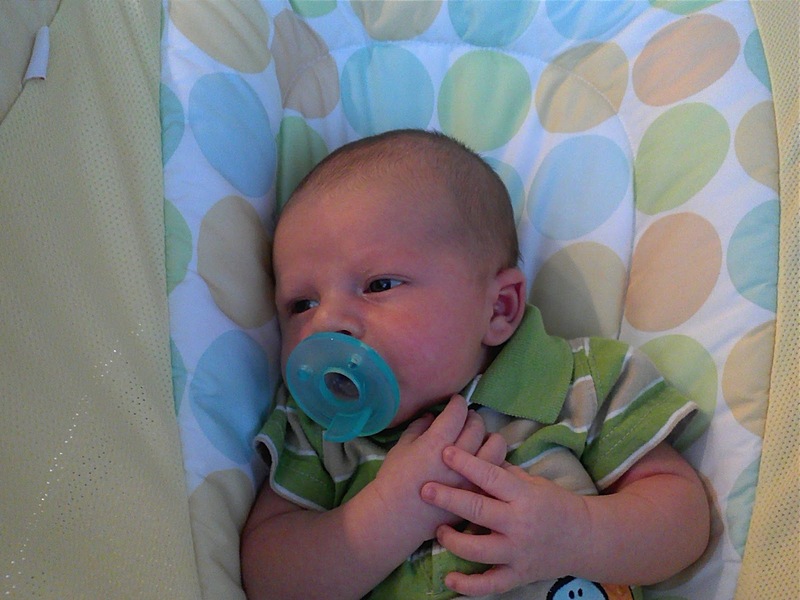 You love to stand up and you love your binky. You love when people come to visit and you especially love listening to your Grandpa Bush's voice. You laugh at silly voices, funny sounds, people eating crunchy foods - and last night: FEET! Sometimes you will laugh at almost anything. I am so lucky to be your Mommy. Until you one day have children of your own, you will never understand how truly, deeply, intensely, and unconditionally I love you. I love the way you hold my finger, the way you smile when I come home from work, the way you calm down when I put my hand on your chest. I love when you grab my face and when you touch my cheek softly. I LOVE your laughter - trust me, your Daddy and I do some crazy things to hear that laughter. I love knowing that you are my son. So, my little peanut, on your 6 month birthday - 1/2 a year!!!!! - although you do not understand this now, you are special and wonderful and amazing. You are smart and handsome. You are perfect. You are loved. It's been 4 months now! My big guy is now 4 months old!! This marks the end of the stage when a baby is at the highest risk for SIDS (2-4 months), so Mommy and Daddy breathed a little sigh of relief that we are now out of that period. 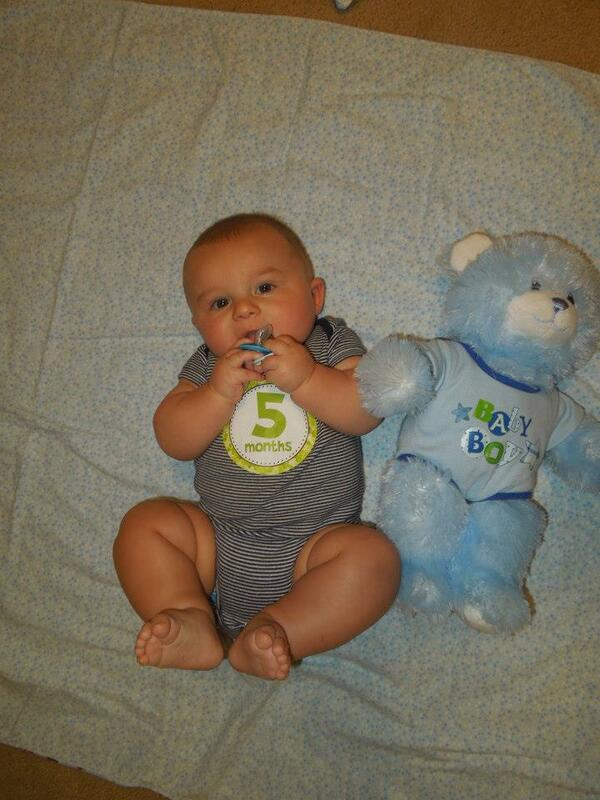 At his 4 month well baby visit he weighed in at 16lbs 15.9oz and 25 in - getting so big! We are already on the search for a big kid car seat since he'll be outgrowing his infant seat in 5 lbs! He was a CHAMP with his second round of shots :) He cried for a couple minutes after the shots - but was smiling at us only minutes later and we never even had to give him any Tylenol. Such a brave boy! We are both amazed at how much he continues to grow and change every day! The most fun this month has been the development of a true laugh! Not just a little giggle or a laugh-like sound, but a full on belly laugh! He makes us work really hard for those laughs, but when he does - it is the greatest sound on the planet! He also smiles much more often now. He is beginning to "play" with toys this month. 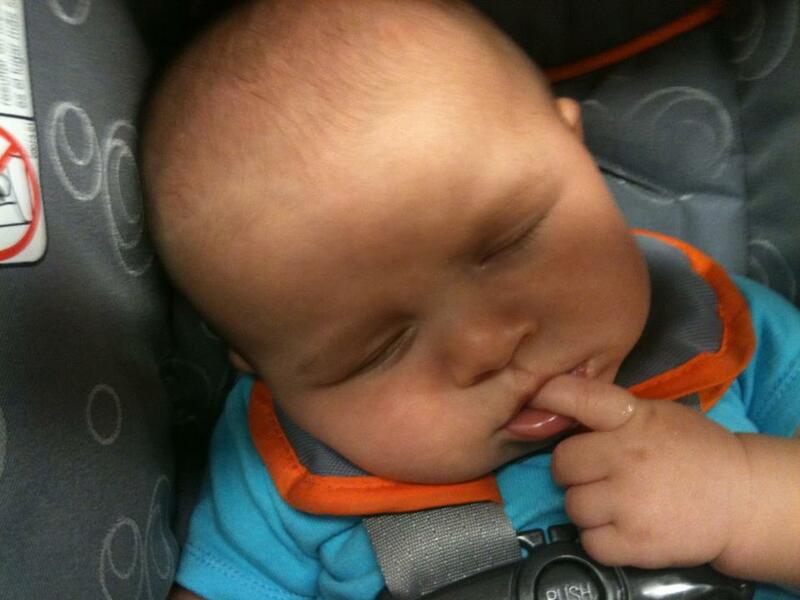 If we put something on his belly/chest, he can grab it and sometimes succeeds in putting in his mouth. A few toys he will just squeeze or move around in his hand. He occasionally reaches for toys too. He got a new Jumperoo toy and the first thing he did when I put him in it was to reach for one of the toys on it :) Loves to grab and hold or chew on his blankies too! Tummy time is feeling less and less like torture these days too! He still isn't rolling (or even showing an interest in rolling) - but we'll get there! 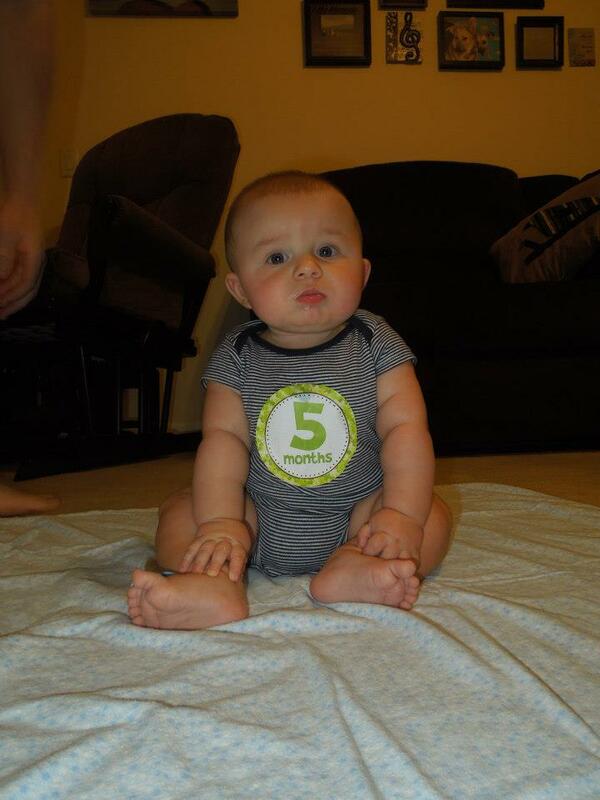 He can kinda sorta sit up (like for 5-10 seconds) with the Boppy pillow supporting him from behind! This month the whole family has been adjusting to my return to work - and it's been rough! I hate leaving every day and Daddy has to work at crazy times so that he can be with Landon while I'm working. Landon, however, has adjusted without a problem. He loves spending time with Daddy all day! Why wouldn't he - he's got a pretty awesome Dad! Hopefully Mommy will either adjust soon too or will win the lottery!! 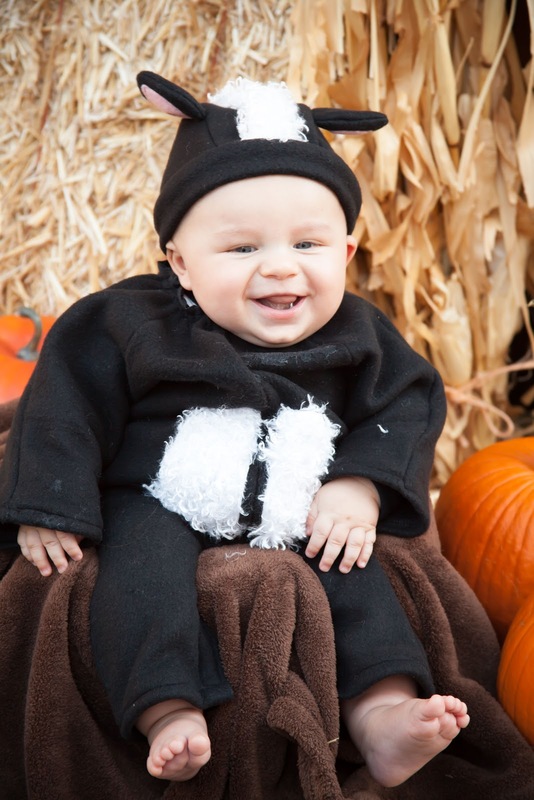 We're getting excited for Landon's first Halloween! He is going to be a skunk and has a super cute costume made by his awesome Grammy Bush! Check out his sweet glow in the dark Halloween jammies! Peanut turns ONE MONTH OLD! Being a parent has been quite an adventure so far. We are learning new things every day. We have learned that with baby boys, it is a good idea to "point" them in the right direction when putting on a diaper. I have learned how to clip teeny tiny fingernails. I have learned that babies are loud - even in their sleep sometimes! I have learned that babies have tons of little creases and folds in their skin that are difficult to clean! I have learned that t-shirts for babies are stupid (it's all about onesies and other one piece outfits!). I have learned that babies create a lot of laundry. A LOT. I have learned what it feels like to be so tired that my body feels like it will just shut off. I have learned what an inconvenience eating, drinking, using the bathroom, showering, and other tasks required to care for yourself can be! 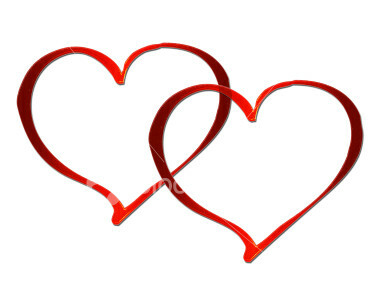 But most of all I am learning more about love! Being mommy is still amazing! I just adore his little yawns, sneezes, and stretches...they are the BEST! 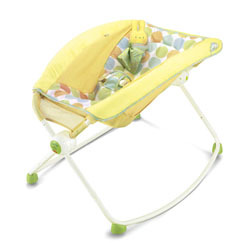 Some more of my "favorite things"
Fisher Price Rock 'N' Play Sleeper. This is by far our favorite baby item. 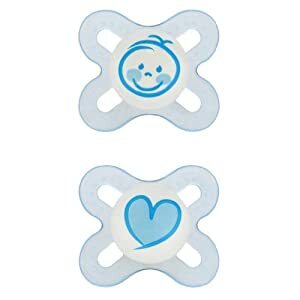 Landon loves being in it, I can rock him in it, it is higher off the ground than a bouncer (out of "dog zone" too), I can put him in this next to the bed and see him while laying in bed (calming my new mommy anxiety) , and less spit up since he is not laying flat on his back! 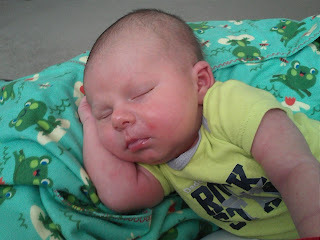 Boppy pillow = arm saver! Well, here's to surviving the first month! I know the coming months will be just as full of excitement as the first :) Happy One Month birthday to my precious boy!